I would love a weekend just to relax. It never seems to happen in my household. With two very active boys, grocery shopping and household needs my weekends seem to be more hectic than weekdays. Mondays end up being the day I recover from my weekend and start the craziness of my normal weekday routine. The weekend also seems to be the time that my kids start acting a little crazy. They are decent during the week, but come Friday night everything goes south. By Saturday they are sick of each other and want their space. Last weekend my husband and I tried to enjoy a rare Saturday night out, which ended with a wild Sunday morning. Plus my youngest managed to shut his finger in a hotel door and his finger was more than a little swollen and purple. I'm hoping as they get older that things start to settle down. Since it's winter squash season I have been using a lot of butternut and acorn squash in recipes. I love butternut squash since it's versatile and adds great flavor to dishes. 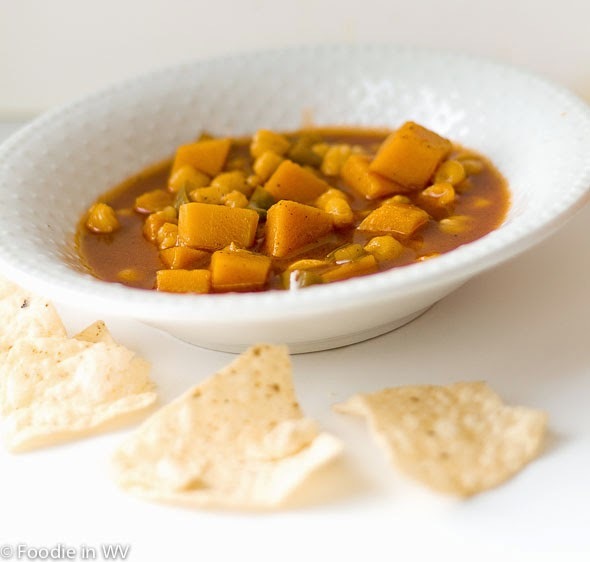 Last week I tried a new recipe for Butternut Squash Posole from the September 2013 issue of the Food Network Magazine. This recipe has 13 ingredients. It takes 40 minutes of total time, 30 minutes of which is active and makes 4 servings. I only made a few changes to the original recipe. First my grocery store can be hit or miss with the types of peppers that they carry. There were no poblanos the week I made this recipe, so I substituted an Aneheim pepper since they were available. I bought regular tomato puree, not no salt added, I just added less salt to the recipe. Topping the posole with avocado is a necessary step. It takes the soup from being average to delicious. I really recommend adding it as a topping. With 9 grams of protein per serving this is a nice vegetarian dinner recipe. My two kids fell in love with this recipe. They ate almost all 4 servings by themselves. I liked that it was easy to put together, while having enough flavor to satisfy everyone in my family. The only change I would make would be to buy 2 avocados since 1 is not enough for 4 servings. 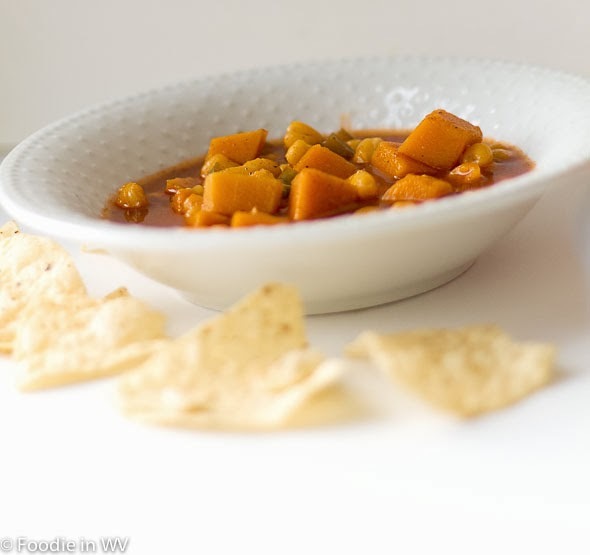 For the recipe go to Butternut Squash Posole. Easy vegetarian soup recipe. Kid friendly and easy to prep. Quick and delicious! Looks totally right up my alley, Ann. It was definitely quick and delicious, which is great! Looks really delicious! This one I can feed to my little girl. Healthy,too. My too boys loved it and didn't notice that it was healthy! Oh man, I hope your sons finger is ok! Our weekend are pretty chaotic around here, too, but the weekdays are just as bad, so I really can't win. HIs finger is much better, thanks :) My weekdays seem to be just as bad too! Butternut squash is one of my most favorite of things to eat. The tip for the avocado was a good one. I'm sorry about your son's finger. I love butternut squash too! The avocado definitely made a big difference. Oh my weekend is always terrible. I wish I could have a quiet one as well but with 4 kids in the house and 1 being a toddler it's tough to make it a quiet one. There is always noise and so I long for the weekday when they're back in school. :) My 17yr old is a vegetarian and she's always looking for more meals to make. I'm going to have to introduce her to this one. My house is always full of noise too, it can drive me a little crazy :) I was a vegetarian for almost 10 years so I understand how hard it can be to find good vegetarian recipes. Healthy and easy! Also,looks delicious! Have a great week! Thanks :) Have a great week too! I love butternut squash soup and I also like to cut it in cubes and roast it. I love it roasted too. It's a great side dish! Ok, YUM! I'm so happy to find some new recipes. I'm following you now! Thanks for coming to my blog! If you try any of the recipes tell me how they turn out! I found you via the Let's Be Friends Blog Hop! They work really well together, plus it's beyond easy! Delicious and easy are always big in my book :) Followed you back!